"Pennylane Quelle Fortune",our "URMEL" has had a very sucessful show career. 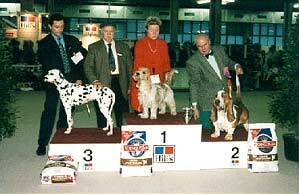 She has been Swiss Champion, International and Luxemburger Champion. Group wins at home and internationally have been no seldom occurance. Today she has left the show ring to her offspring and is enjoying the family life at home.